Visme allows you to create pop-ups and rollovers and applies actions to any object on the screen. 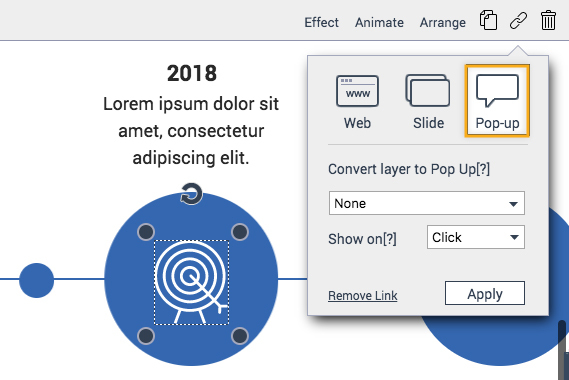 Convert any object to a button and trigger popups on rollover or click without a single line of code. You can easily convert any object into a clickable (or rollover/hover) information to show hidden objects which is perfect for adding it to the websites, presentations and infographics. First, select the object in which you want the pop-up to show in your project. For example, let’s look at the image shown below. Let’s say you want the white bullseye icon to be the object in which you want the pop up to appear. Click on that icon. You then click on Link at the top right of the panel and select the Pop-up tab. Tip: 1.) If you have more than one object, then you first need to group them by selecting the objects that you want to group, and click group at the top left of your screen. 2.) If you want your rename your objects before you do the pop-up, go to object list by going to Menu icon at the top left and select Show objects list in the dropdown. Right panel will show up. Double click on the text and rename. 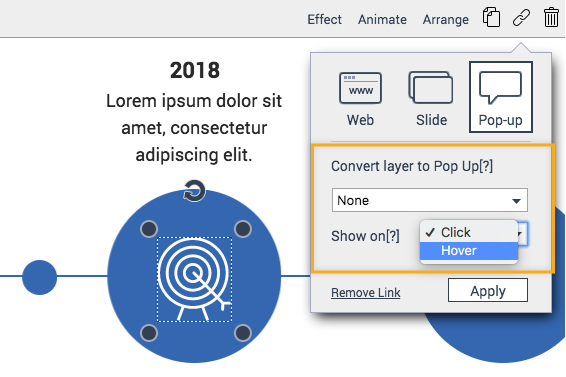 Once you are in the Pop-up tab, you can convert layer or object into a pop-up in which you can set whether to show on click or on hover. Click Apply when you are done. Go to Preview to view the popup and rollover.